You know, after seeing Kmart's Draftfcb-created Ship My Pants and, to a lesser degree, Big Gas Savings, you wonder what the agency could possibly come up with next that would be even remotely interesting. Well, George Parker be damned, the agency has delivered again with Show Your Joe, a co-branded effort with Joe Boxer. In a ad, six men dressed in a tux on top and boxers on the bottom perform jungle belles with, yes, their junk. And this is how we sell underwear in 2013. Your grandmother will be horrified! As, ahem, hand jobs go, the gig is pretty straight forward. Not much skill is required. Unless, of course, you have the finesses of an elephant operating a bulldozer with a bear trap as a back hoe attachment. However, when it comes to hands given the job of selling LG Smart TVs, the gig is a little bit more difficult and requires a bit more skill as you will see in these six, hand-powered ads illustrating epic battles for the remote. Seriously. We've never before seen such skilled hands. The jobs these hands do are simply amazing. It makes regular hand jobs look, well, positively fruitless, limp and entirely unsatisfying. Ukraine-based Escape created the...ahem...hand jobs. What's the best cure for a hangover? Don't let yourself be misled by all those organic concoctions that do nothing but make you smell funny. No, the best cure for a hangover is more booze. Just ask the experts, the Russians. Admittedly well known for getting their epic drink on, they have a product called KBAC/kvass which is created by the fermentation of flour and malt and results in a beverage with 1.2% alcohol, just the right amount to take the edge off a hangover. Or so we are led to believe in this Red Pepper-created commercial. Because after all, this method is akin to fighting fire with fire which, wait a minute, firefighters actually did employ this as a fire fighting tactic so maybe drinking more booze in the morning is all good. OK. Sounds great to us! As part of its Something Special Campaign, Honda sent a ghost hunter to Ernie Santos who claimed his 1996 Honda Civic is haunted. Apparently, the spirits in the car were victims of some sort of crime or accident. Honda sent the ghost hunter, Erik Vanlier of Valley Investigators of the Paranormal, in response to a comment Ernie left on the brand's Facebook page. Following the encounter during which Vanlier asks the spirits to leave, Santos reports he no longer senses the whispers and odd sensations he previously experienced while in the vehicle. We love the quirkiness of Barton F. Graf 9000's work for Little Caesar. BFG just has a wonderful way of capturing the mundane and turning it into something really interesting. The High 85? WTF? Like how do you even begin to think in a way that allows you to arrive at oddball hilarity like the High 85? Brilliant. A second spot takes the simple expression of "Ohhh" and turns it into a cavalcade of silliness that's just this side of stupid. The agency has done a fantastic job bringing to life the oddity of the brand's Little Caesars "pizza pizza" character. And they've made pizza ads fun to watch again. Yup. OgilveyOne Athens, the agency behind the amazing Lacta Chocolate work, has created a bra that will send a tweet each time it is unclasped. Why? Well to encourage women to perform self-exams from breast cancer detection. Sponsored by Nestle, The Tweeting Bra uses a mechanism that is connected to a smartphone via bluetooth and automatically posts a tweet every time it is unhooked. The campaign features Greece's popular and well known television personality/celebrity Maria Mpacodimou. For 15 days, Maria will wear the bra and each time she unhooks it, it will post a tweet to her hundred of thousands of fans/followers about breast self-exams. Hmm. Seems parents of teens might want a device like this for their daughters to who may be taking their bras off for reasons other than to simply undress. Yes, it's dumb. But somehow it almost manages to be funny. 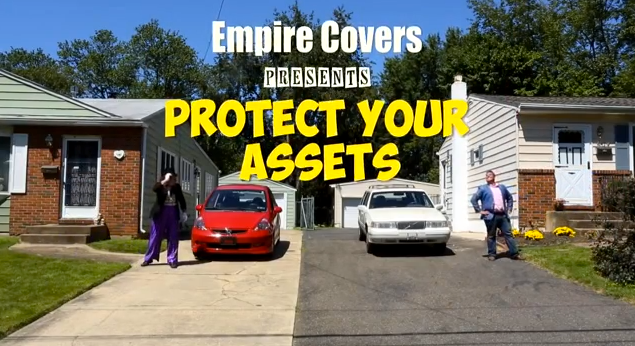 In the style of the late night infomercial, this EmpireCovers ad pulls out all the cheesy stops. Cheesy dialog. Cheesy sound effects. Cheesy lighting. Cheesy acting. Go ahead. Give it a watch. It will make you feel much better about what you're working on right at this moment. You've got to love the way the online education segment markets themselves. They've jumped on the whole infographic thing and are producing copious amounts of infographic content customized to various industries. We've receive quite a few infographics from online colleges over the last several year and, for the most part, they are valuable and informative. This infographic from International Business Degree Guide is all about the faux pauxs that can occur when translating work to and from differing cultures. 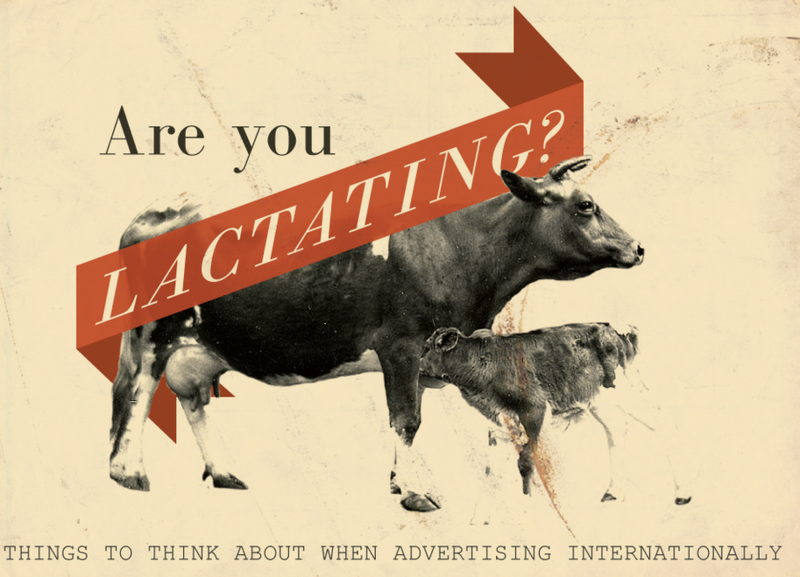 The infographic takes a look at languages challenges (Got Milk's "Are You Lactating?") culture (black face is OK in Thailand but not in America) and color (black connotes expensive and powerful in Asia). Nowhere near as funny as the original, Benefit Cosmetics is out with "Real Women Don't Fake It," a video whose subject matter is exactly what you think it is. But it doesn't come close to the hilarity of the original which actually kept you guessing a bit longer than does this sophomore effort. In a strange new, Droga5 Sydney-created commercial for Lynx (Axe), we are told women want men and boys in the same body. Why? Because we are told boys dream of being men and men dream of being boys and, yes, women long for both...at the same time...in the same body. So like Lynx is marketing to the man-child and they think using their product will attract ladies who want a man and a boy...at the same time...in the same body?